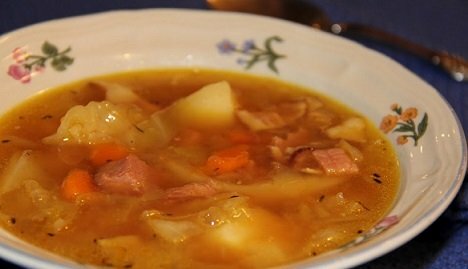 This hearty Ham Vegetable Soup Recipe makes use of left-over ham and vegetables. You can add a ham hock for even more flavor if you wish. Substitute or add other vegetables you may have on hand if you wish. The soup will remain delicious. The smoky flavor of ham blends wonderfully with almost any vegetable. Soup is a wonderful creation. We can prepare delicious soups from almost anything we have on hand. They can be stand-alone meals or an accompaniment to an entree. In the 1500's in France, the word "restaurer" was used to describe a thick soup sold by street vendors. From that evolved the word "restaurant," after a French businessman opened a shop in 1765 that specialized in "restaurers." 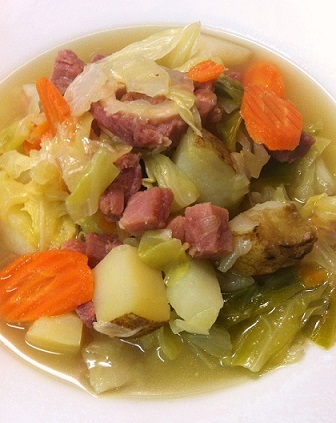 This hearty vegetable ham soup is one featured often by the restaurant as it is a favorite soup of the customers. Note: This recipe contains about 23 grams of carbohydrates per serving (assuming 10 servings) but if you leave out the ham hock and potatoes - sub in more cabbage or another low carb vegetable - the result is only 9 grams of carbs per serving. Unless you're on a low carb diet, serve this hearty soup with some crusty bread. 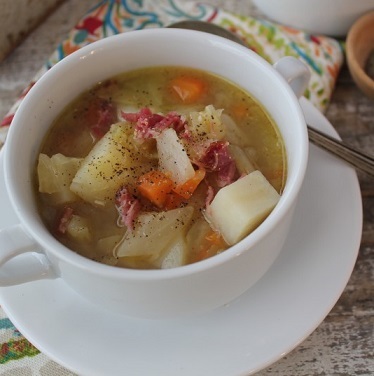 Enjoy your hearty Ham Vegetable Soup and the company of those you share it with!